Last week, my blogger friends and I went to La Union for a 1-day tour and our 2nd stop and the highlight of our tour is the Tangadan Falls in San Gabriel La Union. 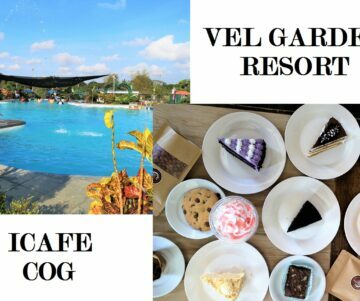 It is almost a 5-hour drive from Manila and an hour away from Baguio City. Goin to Tangadan Falls is a 1-hour trekking, however, because most of us are not into trekking, mountain climbing, and any other outdoor activity, our trek took us 2.5 hours, lol. Yes! 2.5 hours just to go to this beautiful falls. 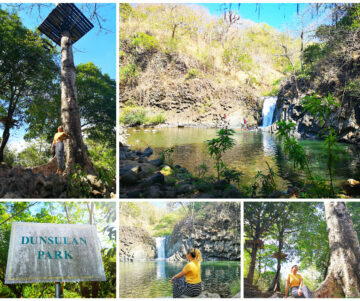 We stayed for 4 hours to enjoy the scenery, have boodle fight lunch, jump off the cliff and swim at the river. Going back to the parking lot where our private rented van by KG Travels is parked, it took us only 1.5 hours to go back, why? because we are all rushing and the rain is giving us panic attacks because if the rain won’t stop and we’re not yet able to cross the river for 2x, our tour guide will call for rescue coz the water on the river is getting high and the current is getting strong as well. I was praying that the rain will stop and we can cross the river. Kudos to Kuya Reymond (our tour guide) and Kuya Kit (driver/owner of the van) they helped us all crossed the river. It was such a panicky, full of stress and body aching trip. All the body pain, tumbling on the water irrigation, falling down are all worth it. I was there two months ago. I really like Tangadan falls since the trail was beautiful and the falls was even better.